A creative convert, Sara put her career as a dentist on pause to dedicate herself to her art. 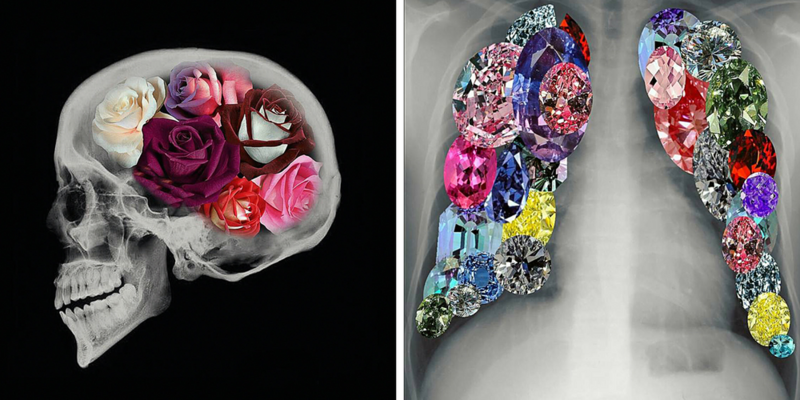 Her style is mainly characterised by photography collages, embellished x-ray scans which she brightens up with diamond and floral patterns laid over. Why not picture her work on pillows or acrylic blocks to add a rebellious touch to your home decor. An artist worth highlighting for his retro collage style is Leftfield Corn. 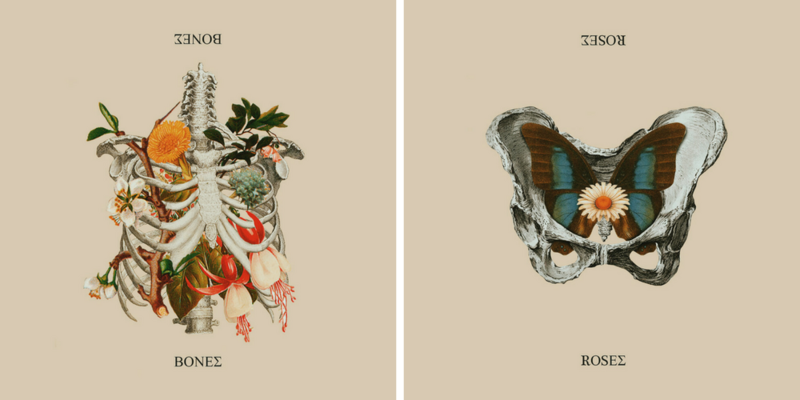 His collection of vintage anatomy illustrations and floral imagery recall similar festive vibes to the Mexican Day of the Dead. We picture this beautifully printed on a coffee table 6” acrylic blocks, or one of our premium tote bags. This artist’s surrealist compositions are largely open to interpretation. Dada22 is an ace at digital manipulation and often merges facial imagery with floral and landscape prints. 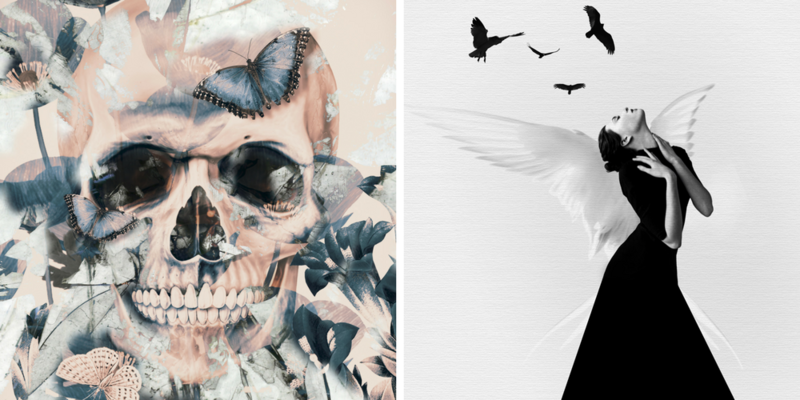 In line with Halloween, we’ve selected a couple images with spiritual undertones. Dada 22’s digital prowess comes across best on our large printed formats for maximum definition and impact. 512 Gemini brings a breath of fresh air to the stereotypes of the Halloween season. Her work features desolated forests and misty scenes further contrasted through black and white photography. 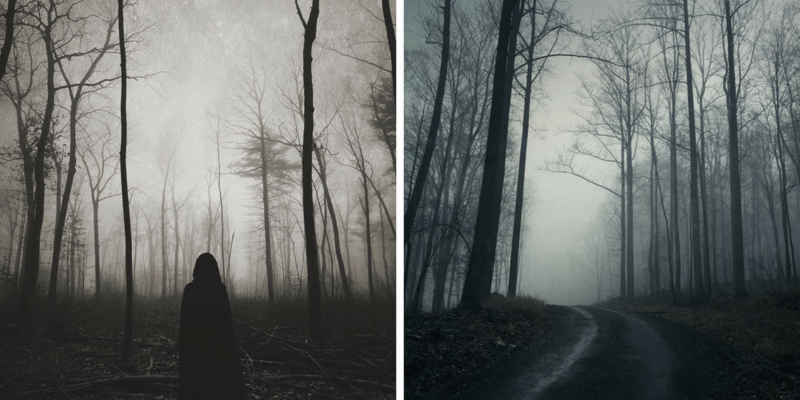 Her image entitled “Shadows Fall” conveys a sense of fear and discomfort, as you see the mysterious caped figure in the depths of a dark forest. Gemini’s striking work would make a perfect aluminium or framed print hanging on a living room wall.